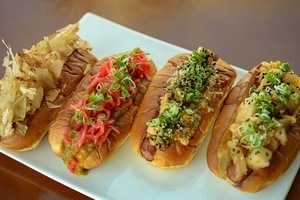 A selection of Japanese hot dogs, now available for lunch at ICHI Sushi. Photo: Darren Samuelson. A couple of Korean openings for you, starting with ~THE KOREAN KITCHEN~, now open in the Inner Sunset and serving a menu of classics like bibimbap, tofu soup, jap chae noodles, and more. Open Mon and Wed-Fri 11am-3pm and 5pm-10pm, Sat 11am-10pm, Sun 11am-9pm, closed Tue. 1220 9th Ave. at Lincoln, 415-566-5777. There’s a new all-you-can-eat Korean barbecue place in the former Juban Yakiniku House in Japantown called ~BEQUE~ (it also has locations in Santa Clara and Newark). You can look at the menu and pricing here. Lunch is $15.99 and dinner is $21.99. Beer towers in effect. 1581 Webster St. Suite 145 at Post, 415-872-9868. Open Mon-Fri 11:30am-2pm and 4:30pm-12am, Sat-Sun 11:30am-12am. Let’s move away from meats for a moment, because you also need some vegetables. Opening Wednesday February 1st in ~THE HALL~ is the second location of Oakland’s ~CORE KITCHEN~, which claims to be the world’s first produce-only restaurant, making meals only from fruits and vegetables, without salt or oil. The location will be open Mon-Fri 11am-8pm. Although it seems it will be short-lived since it looks like The Hall’s temporary existence is truly limited—Hoodline reports it will be closing at some point since plans for the building taking its place have just been approved, so demolition should be soon. 1028 Market St. at 6th St.
Great news for the ~ICHI SUSHI~ crew, who keep on trucking. They are now serving lunch during the week, including sushi rolls and a selection of Japanese hot dogs (like a kimchi dog, curry dog, and mapo tofu dog), plus seasonal side dishes. Grab a seat at the counter, crack open a beer, and congratulate yourself on knowing how to do lunch right. Open Mon-Fri 11:30am-2pm. 3369 Mission St. at 30th St.
Night owls and partiers: ~MEZCALITO~ on Polk Street is now open late, until 2am, with food available until 11pm. 2323 Polk St. at Green. Just before Valentine’s Day, ~TOUT SWEET PÂTISSERIE~ is moving from the third floor to the ground floor at Macy’s Union Square, right at the Geary Street entrance. And to celebrate, the first 100 customers each day from February 1st-5th will receive a free Valentine’s Day Hot Lips, from chef Yigit Pura. Was sorry to read that Emily Day is closing her Lower Nob Hill bake shop, ~FLOUR &AMP; CO.~, after almost four years. The Hoodline piece mentions she will continue to sell some items online, like her granola. 1030 Hyde St. at California. It seems things were slipping for a while at ~KIJI JAPANESE~ on Guerrero with the new owners that came on last fall, and now it has closed. 1009 Guerrero St. at 22nd St.